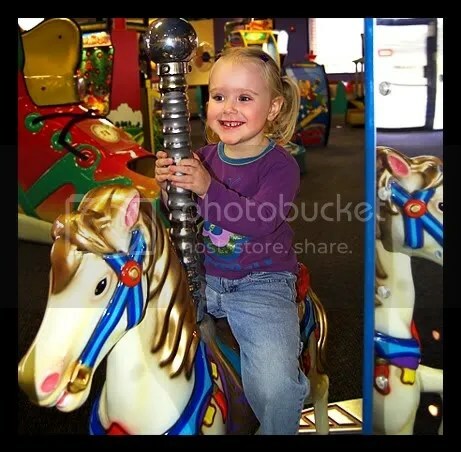 On the last free Wednesday before my prenatal visits became once-weekly, I decided that it was high-time we took the Puffy Wonder to Chuck E Cheese’s for a morning of fun! This trip was super-special, because Chuck E’s is very close to Gammy’s house, and Gammy happened to have Wednesday morning off – so we grabbed her on our way to join in the fun. . .
We were there minutes after they opened, so we had the place to ourselves – which was perfect. It’s a lot different from when I was younger, now they have a huge section devoted to toddler stuff! 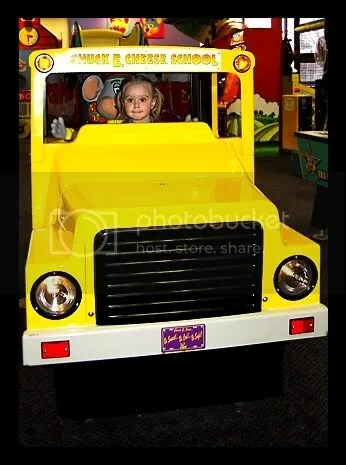 T had a fantastic time playing with all the kiddy video games and rides without having to wait her turn. She wouldn’t let me take a picture of her playing her first video game ever (which is to say, when I stopped playing it WITH her, she ran away before I could get the shot), but for the record it was a dinosaur jumping game – way cute! The thing had all of 2 buttons, one for run and one for jump. Love it! can you spot the Puffy One? And let me tell you. . . the static that those tunnels generated. . . *giggle* I don’t think that T ever noticed, but I was terribly amused! And as if all of that wasn’t enough to make little T just as happy as a Puff in mud (which it was) after several hours of insane playtime, she got PIZZA! And after that?! FABULOUS PRIZES!!! Since we got there so early, the staff had just finished testing all of the games, leaving the tickets that were generated just sitting on the machines. Gammy set off on a quest to collect them all, and added them to our own paltry winnings. She had seen a beautifully bejeweled tiara in the prize bin, and was determined that Puffy should have enough tickets to get such a pretty treat at the end of our day. When the time came for the choosing of the winnings, however, T adamantly refused said tiara, settling on a pair of purple snakes, and a spider to come home with us instead. . . she still had enough tickets to get a set of finger-rings, too! 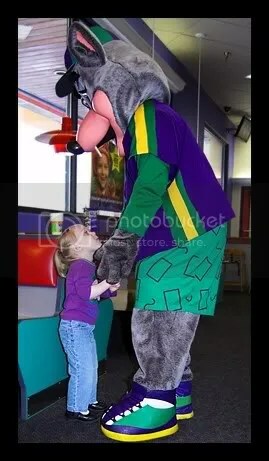 See ya next time, Chuck E! To say that Puff had a great time would be a huge understatement. She had SO much fun! INSANE amounts of fun! BUCKETS FULL of fun! She’s still talking about it, and I can’t wait until we get a chance to go back again! 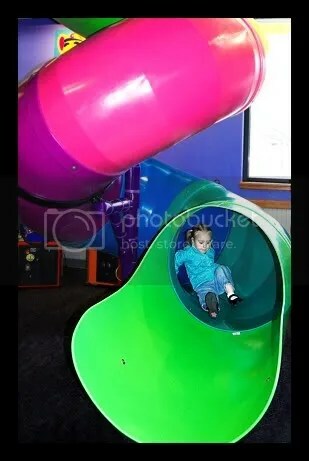 I don’t remember my Chuck E Cheese being that cool! 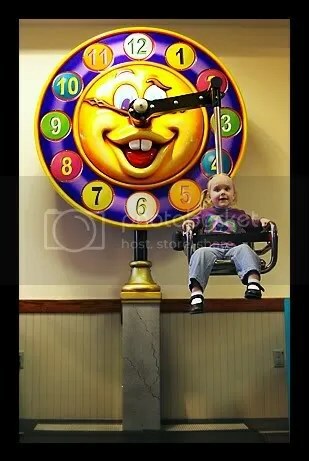 Chuck E Cheese scares me a little bit. It’s a great post but I don’t like your quote! My 2 year old loves Mickey Mouse and he is not a 6 foot tall rat! He actually isn’t that tall! Like seriously in the pictures from Disney he was shorter then Jenn! 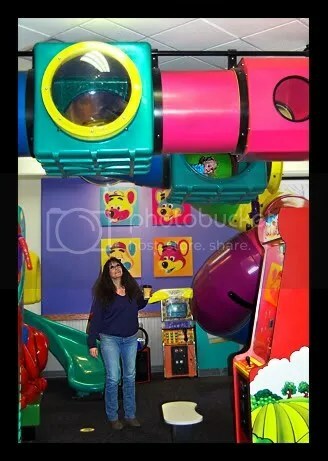 Haha but I do love Chuck E Cheese! And that hickory dickory dock thing was the coolest! That sounds like SO much fun! Even better that you guys were pretty much alone. How wonderful. 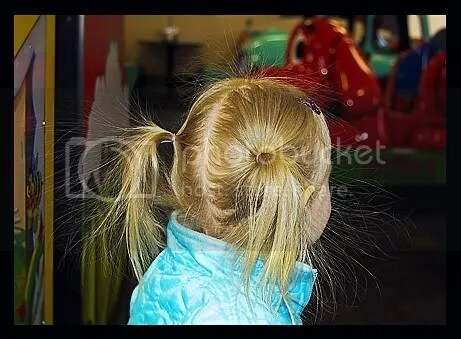 The static, so cute. me either!!!! it was a fun day to see my granbaby experiencing such new and fun things! next time, i’ll keep the tickets for myself and get her the tiara (ha ha)! or maybe next time i’ll get to play with T while mom stays with Ro, OR, i’ll get to stay with Ro while mom plays with T. either way, it will be buckets of love and fun for me! love my girls, T, Ro, and Jes!!!! !, love Remy, too!!!!!! !